Some people have the ability to get out of any situation. This becomes a problem when one of these people is also a homicidal maniac. As always we start with the cover, Hush has tied Alfred to a chair and is dangling him down a cliff. So Hush will escape this issue if the cover is anything to go by. This week in general Alfred has been through a lot. In the main Batman comic he had his hand cut off by the Joker and in the Gotham TV show he got stabbed in the gut by a friend. We begin our story in the bat cave where Hush talks to himself as Alfred wakes up from a nightmare. We also get reminded that Wayne Manor is the new Arkham Asylum. Why we get reminded of this, I don’t know. Just seems a bit weird to have it on the first page. We cut to a roof-top where Julia is putting on a costume to confront Selina Kyle. Julia’s outfit looks completely ridiculous with a mask with the Bat symbol with no eyes or mouth. How does she even breathe? The way Julia jumps around buildings and leaps up on Selina Kyle is very much like Spiderman! Selina Kyle attacks Julia but Julia quickly pins her down with ease. After this, Selina Kyle gives Julia a shipping manifest to help Batman. Does Selina Kyle want to help Batman or is this a peace offering covering up an alternative motive. Julia leaves Selina Kyle via a grappling hook and looking more like Spiderman. I hope this is just going to be a few pages because I don’t know if this is a joke or what. Batman slides back to Gotham while he talks to Alfred about learning that Ra’s al Ghul is not involved in the conspiracy and figuring out that the theme of the attacks are about legacies. I think I know who the mastermind is but I say again that I am not going to tell you until he or she appears. While this conversation is happening we see the Bat plane has been drawn to look like an X-wing fighter from Star Wars. Julia relieves Alfred and fills in Batman about Selina Kyle given every psychopath what they want. We get to see the inside mechanisms of the Bat plane as the two have this conversation. I don’t know why. It is utterly pointless. At the Gotham Cathedral, the Scarecrow and his goons set up drones to fly around the city to spread the fear toxin. How did the Scarecrow get on top of the Cathedral? And, why are his henchmen wearing similar masks as his? I never understood that part of villain logic in having your henchmen wearing the same mask as you. As soon as the drones are ready, Batwing comes flying in to stop the Scarecrow. We don’t see if Batwing succeeds in getting the upper hand over the Scarecrow but I think he will. We cut again to a movie studio where Clayface is pretending to be Batman as he is forcing another actor playing the Joker to stab him. This is a throwback to Clayface’s origins and shows us that Clayface still has the same goals that he had before he became Clayface. Fans of Clayface will be very happy with this scene. Unbeknown to Clayface, Red Robin is up above him and starting his attack on Clayface. Like Batwing, we have no idea if Red Robin is successful. I think the writers are setting up sub-stories for the final five issues. Julia gets in touch with Blubird and Batgirl as they close in on their target. Bluebird’s target is Mr. Freeze while Batgirl’s is the Joker’s daughter. We learn that Bluebird’s target was actually Poison Ivy, but Mr. Freeze is at that location instead. This is obvious because Selina Kyle is hiding Poison Ivy which the Bat Family does not know about yet and shouldn’t at this time. Batgirl hunts the Joker’s daughter at the Theme Park from the Batman story “The Killing Joke”. Batgirl says the Joker brought her here after the Joker shot her but I don’t remember that being part of the story. Julia then gets in touch with the Red Hood to see how he is doing on his mission. We don’t get a clue about what his mission is. What we get is a short argument between him and Julia. The Red Hood enters a bar while talking to Julia but Hush has invited a friend over to the Bat cave. I have no idea who Hush’s friend is nor do I have any idea why the Bat Cave’s security is so poor. Meanwhile in the bar where the Red Hood is, we learn that the bar is also a fight club and Bane is there with robotic armour. Now that is just overkill! Why does Bane need or want robotic armour? He is strong as a tank. At Bluebird’s apartment, Stephanie Brown has a discussion with Cullen about not being able to leave the apartment and how she needs Vicki Vale. This scene feels very out of place in this issue and I don’t why they couldn’t put it in the next issue. Back in the Bat cave, Alfred wakes up being tied to a chair and Hush laughing at him outside of his cell. Hush used a rocket to fly Julia away to the ocean to get rid of her. How did Hush get out? We already know that another person was in the Bat cave. Why are they not revealing themselves? We end with a mysterious figure announcing himself to Hush as they hijack the Bat plane remotely forcing it to crash. Soon we are going to learn who is behind the conspiracy and why. I just can’t wait. Is it always good idea to put time travel in any story you want? The answer is no. As always, we start with the cover. 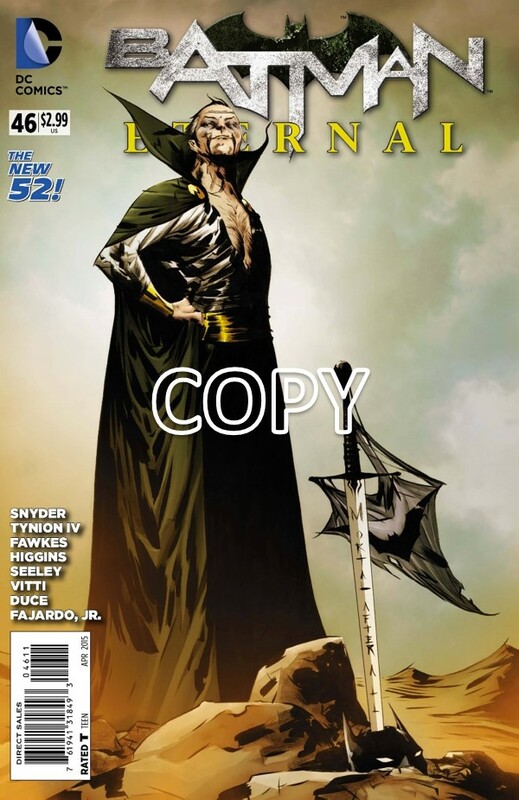 Ra’s al Ghul stands in a desert with a sword through Batman’s mask and his chest piece used as a flag. I wonder if Batman goes to Ra’s al Ghul or Ra’s al Ghul will come to Batman. There is a message on the sword that says ‘Mortal after all’. What could this mean? We begin our story with Poison Ivy talking to her guardian about taking over Gotham. Her speech is something that we have heard before and there is nothing new to be said. We cut to Batman attacking Ra’s al Ghul’s fortress head-on yelling for Ra’s al Ghul to come out and fight him. As much as Batman says this fight is easy, the first panel does not convey that image. I don’t know if it is a smart idea to march through the front door of the League of Assassins. Batman could have easily done a stealthier approach. In another room Ra’s al Ghul and Dr. Darrk discuss over the phone about how Batman is too late to stop them from their plans. We learn their plans are to use time travel to achieve their goal. Am I still watching this week’s episode of the Flash? As far as I know there is only a few Batman stories with time travel in them and I have not read any of them. Back in Gotham, Selina Kyle visits her Dad in Blackgate Prison. Besides the two inmates doing a bit of comedy in the background, there isn’t much to this page. As we turn the page, Selina Kyle and her Dad begin a conversation which shortly becomes an argument. While we haven’t seen this kind of argument before, it still feels very similar and very predictable. In the bat cave, Julia is cleaning up while Hush is taunting her as per usual. There is a point where Hush acts a bit like Hannibal Lector but they don‘t go that far. The writers use bits and pieces from Silence of the Lambs as a framework and rewrote them to fit Hush. It is more of an inspiration than a direct reference. Julia ignores Hush and checks on her father, Alfred, who is still unconscious. We see Julia’s caring side which is different than how we saw her in the beginning. Julia gets in contact with Batman but before Julia could say what she wants, Ra’s al Ghul uses telepathy to talk to Batman in his mind. The most important part about this scene is that Ra’s al Ghul reveals to Batman that he has used time travel. This is interesting. It will give Batman another obstacle and show the reader something different. Ra’s al Ghul uses magic to show Batman some of his successes from possible futures. If you’re a long time Batman fan, you’re going to be impressed. You’re going to see Damion Wayne and Batman Beyond. For readers who don’t know much about the Batman universe, you are going to be confused. Ra’s al Ghul continues his game by getting a multitude of future Batmans to attack the current Batman but we soon find out it is all an illusion caused by Dr. Darrk. The fight scene is well drawn and feels like it fits. I don’t know anything about Dr. Darrk as Batman says he is supposed to be dead. I have no idea what he is talking about. It would be greatly appreciated if anyone could tell me what graphic novel to read to learn who Dr. Darrk is. From behind Batman, Lord Death Man comes out of nowhere and attacks Batman. Batman quickly grabs Lord Death Man and knocks him and Dr. Darrk out. What are the writers trying to do? Have every single bad guy in Batman’s history appear in this series? If the Mad Monk shows up next, I’m out of here! As Batman turns around, we learn that Lord Death Man is not knocked out but Batman quickly deals with him again. There is nothing impressive to say about the take-down and it could have been filler. Ra’s al Ghul continues his illusions against Batman showing him his failures and telling Batman that he didn’t have any part in the conspiracy. That’s what every bad guy says! Batman finds a way out of the illusion only to find Ra’s al Ghul on his deathbed attached to medical equipment. This is a surprise. We have never seen Ra’s al Ghul in this kind of state before. He always used the Lazarus Pits to heal himself. I know Ra’s al Ghul’s main Lazarus Pit was destroyed but he found another one via his minions in the Red Hood and Outlaws series. Ra’s al Ghul and Batman have a discussion about Ra’s al Ghul bringing Batman to him to prove that Ra’s al Ghul is not the mastermind. I knew it wasn’t Ra’s al Ghul. The issue was just a misleader but I still have no idea of who is the mastermind. 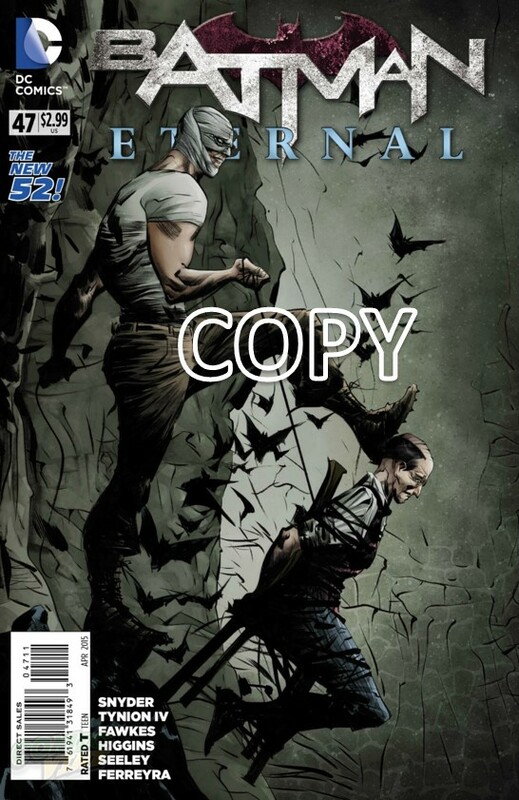 Back in Blackgate Prison, an inmate brings Leo, Selina Kyle’s father, a disturbing letter. We know that something is being brought into the prison, but what? We end with Leo learning that his daughter is giving every super villain in Gotham their heart’s desire. This can’t be good for any one. What is Selina Kyle thinking? This is the issue where we finally learn the identity of the master mind behind the conspiracy, ordo we? I mean we still have seven more issues, anything could happen. As always we start with the cover, Batman is grabbed by a bunch of giant hands as an airplane heads towards the Dark Knight. Ladies and gentlemen, this is why you don’t fly economy. The cover is very well designed and reminds me of a scene from a zombie movie. We begin this issue with ghosts reaching towards the reader as a man in the background cries out for help. Apparently Batman is becoming the X-Files this week. The ghosts are drawn in a way that they remind me of the Sandman comics. As we turn the page, we learn that the ghosts are after Professor Milo and Batman is just in their way. The many ghosts are saying so many things that are not related that it is hard to focus on what they want but I feel that this was deliberate. As of this moment, I don’t know if these are real ghosts, nanobots or magic. One of the spirits takes over Professor Milo’s body giving Batman a chance to question the entity. We learn that one of the ghosts is Mr. Bygone. I know we saw this character before but I can’t remember which issue. After Mr. Bygone leaves Professor Milo, Batman tries to help Milo medically but the GCPD surrounds Batman. I thought that when Batman took care of James Bard, the GCPD went back on Batman’s side. Maybe I missed something. Across town in the apartment of Luke Fox, we see Batwing having to deal with a ghost infestation with no knowledge about how to deal with it. Batwing tries to punch the ghost but his fist goes right through it. Isn’t that Ghost 101 that they can go through solid objects? As far as I know that has been common knowledge. 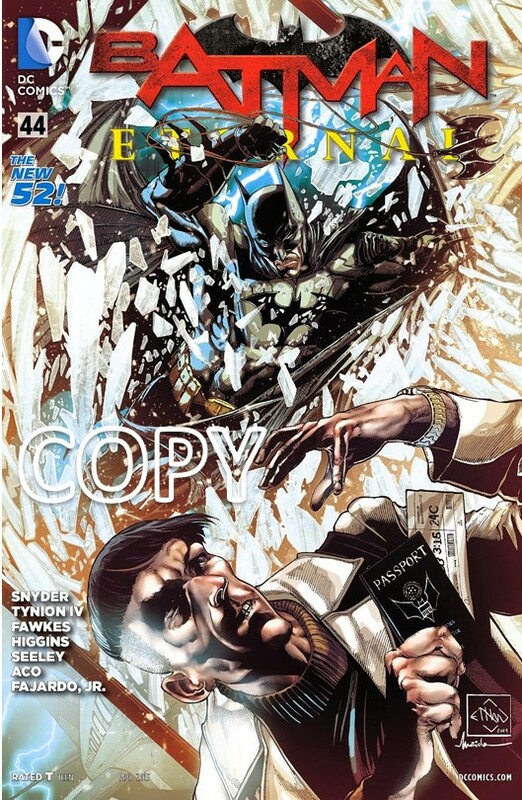 Batwing continues his fight against the ghost as we also see how Batman deals with the GCPD. It seem weird to have two unrelated scenes on the same page. That being said, if this happened at the beginning of the chapter, it would have made much more sense. Batman uses a flash bomb to distract the police and get away. We have seen this many times and I am bored with it. Back at Batwing’s apartment, James Corrigan walks in as Batwing finishes off the ghosts by punching them. How in all existence can you beat ghosts just by punching them? Either the writers are crazy or these aren’t real ghosts. Batwing tells Jim Corrigan that since Jim had introduced him to the spirit world, it has been haunting his mind ever since. This is an interesting character development for Batwing and makes me wonder if the writers will put Batwing into a paranormal role. Jim Corrigan gets a call from Batman asking Jim for help in questioning Professor Milo. Jim tells Batman to meet him at a cemetery. Why? That is the last place I want to be when ghosts are loose in Gotham! At the graveyard, Batman gives Professor Milo to Jim Corrigan for interrogation while he talks to Batwing. Batman and Batwing’s conversation is pretty unimportant and stuff we hear all of the time. Jim Corrigan learns that Milo was using a forbidden spell book that is not even in use by the best magicians. What is this book? The Book of the Dead or something like that? We cut to another apartment, this time the home of Harper Row, where she and Stephanie Brown have a heated argument about trusting Batman. The argument is typical of teenage girls which both characters are. It is just nothing we haven’t heard before. Harper Row aims a stun gun with a tracking device on Stephanie Brown to ensure that Stephanie does not leave while Harper is out. How did Harper Row acquire this weapon? The writers have not explained this. 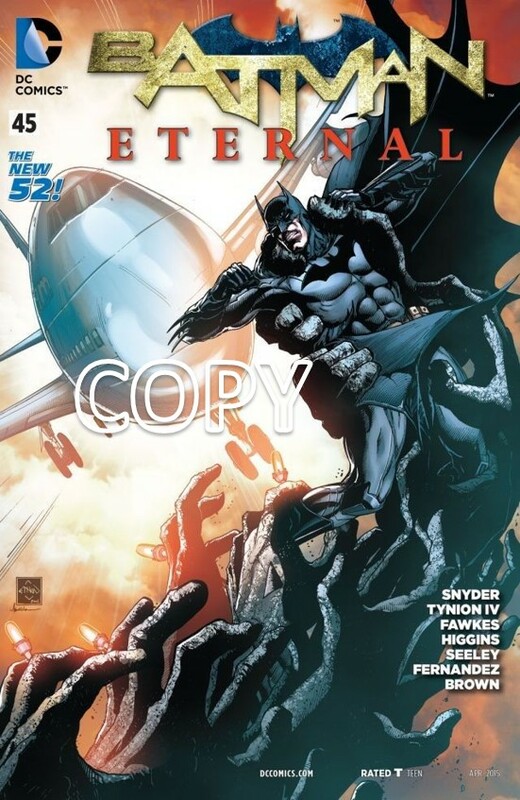 In the bat cave, Batman and Julia are trying to decipher some text that could lead them to the mastermind of the conspiracy against Batman. Julia tells Batman to take a break which prompts Batman to comment that she is a lot like her Dad, Alfred. Not sure what the goal of this page is. It could just be filler. Batman and Julia catch on to the clues left in the text and the pair start talking about who they think it is. This is dragging on a bit because they don’t actually say who is on this page. You have to turn the page to find out who it is. We end this issue with Batman telling Julia that Ra’s Al Ghul is the only man who could do all the terrible things that have been happening in Gotham. I’m so glad I didn’t put any money on the prediction that Ra’s Al Ghul was not that bad guy because I would have lost my money. I hope they explain more of why Ra’s Al Ghul is doing all this to Batman. Tonight on Gotham’s most wanted, the Dark Knight hunts for the evil Professor Achilles Milo. Wait a minute, who? As always we start with the cover, Batman crashes through a window in pursuit of a guy trying to escape with a passport. And more to the point, who is he? The preview of this issue (online) made the man look like Carmine Falcone but looking at the cover of the comic, I can see that he is not Carmine Falcone. We begin in the GCPD where the cops are questioning three Arkham escapees about a person. One of the cops looks like Captain Maggie Sawyer but no one says her name so I can’t be sure if it is her. It reminds me of an intro to a second part of a two-part episode of CSI. The three escaped fugitives tell us a name. We cut to Batman talking to Julia as he begins his hunt for Professor Achilles Milo. Great choice of a name. Probably won’t hear that name again after the series ends. We also have another art style change but it looks like a previous art style that we have seen before in this series. We soon find out that the entire Bat family is looking for this Professor Milo. We have yet to learn why this Professor Milo is such a big deal but we know from the preview summary on the web site that he knows what’s going on. We cut to Luke Fox’s apartment where we continue his stories from issue 37. Luke Fox is dealing with a ghost infestation. I don’t know if it was a right point in the story line to put this. I sure don’t want to go through what Luke Fox’s is going through right now. Where are the Ghost Busters when you need them? We cut again to the apartment of Bluebird. We see the Spoiler trying to leave the apartment as Bluebird tries to stop her. Spoiler is still convinced the Bruce Wayne is Hush which is very interesting and opens more pathways for future issues. Bluebird points something at the Spoiler but I can’t tell if it’s a gun or what. Spoiler and Bluebird start a fight with no clear victor. I thought they resolved their issues in the last issue so I am a bit confused. At the Gotham International Airport, Professor Milo is checking himself in as the security spots him. Professor Milo obviously does not have a good disguise on if the security recognizes him right away. Here is a tip for everyone: unless you have a great disguise do not go to the airport with a warrant on your head. The security guards catch up with Professor Milo only to have him release a smoke bomb. We see from the panels that the smoke bomb also contains hallucinogenic chemicals. As soon as the bomb goes off, Professor Milo tries to run away but Batman crashes through a window in front of him. The complaint I have with this, is it not clear in which direction Batman is crashing in. A short fight ensues between Professor Milo and Batman but soon Batman get the upper hand. Batman attaches a hook to Professor Milo’s belt and hoists him up to the ceiling. This doesn’t look like it is doing much good to the Professor’s back. With the Professor being dealt with, the people in the airport are under the influence of the gas left over from the bomb. Batman has to tie up people so that they don’t hurt each other. This may look and sound violent for Batman but at this time it is the only thing that Batman can do. Professor Milo uses this time that Batman is distracted to cut the rope and start his escape. As much as this is to add drama, Professor Milo would have two big obstacles in his way, one is a back injury and two is thirty foot drop between him and the floor. Despite this, he is still able to run outside. Professor Milo does not get too far due to the fact that the Bat plane catches up with him. Here is where I usually would say Batman would not have enough time to get into the Bat plane and catch Professor Milo but I am going to give it to the author for this one. The way the last few pages were set up gave Batman just enough time to finish what he is doing and get in the Bat plane, but just barely. We learn that Batman is controlling the Bat plane by voice commands as he commands it to fire at Professor Milo to only disarm him. This is something I forgot that the Bat plane could do. I didn’t realize it could be commanded vocally. Batman jumps in front of Professor Milo to violently interrogate him. The only words we can get out of Professor Milo is “the world beneath”. What does this mean and does it have a connection with Blackfire? We end this issue with ghostly hands grabbing Batman and Professor Milo. There is one Batman villain that could do this but Ra’s al Ghul has too respect for Batman to do all the events that enfolded in Batman Eternal.